This dish has been a firm favourite at The Coal Shed, its bold flavours really make a statement. 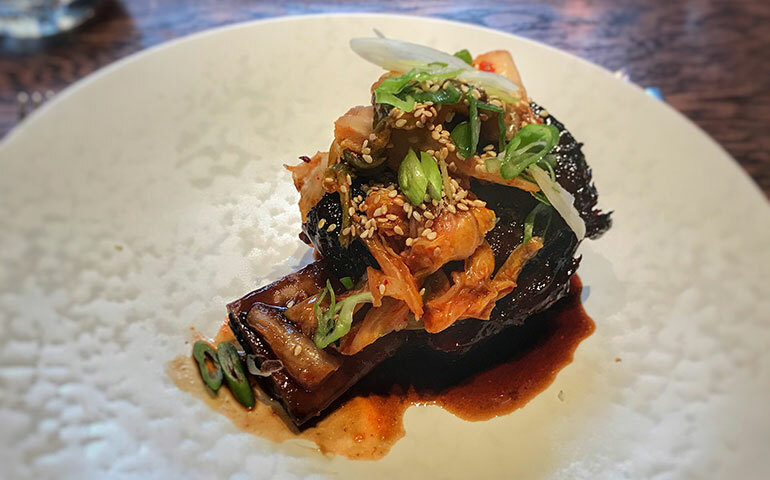 The beef short rib falls off the bone and the glaze is sticky and rich. First make the brine by placing all the ingredients for in a pan and bring to the boil, making sure the salt and sugar is dissolved then allow to cool and cover. This can be made in advance. Next make the onion ketchup which is going to be the base for the final sauce. Slice the onions very finely and add to a pan with a touch of salt and cook down very slowly for about 2 hours until nicely caramelized. Next add the vinegar and reduce, add the soy sauce, honey and leave to simmer. Transfer to a blender and puree into a smooth paste. Cover and set aside. For the coffee glaze, sweat down the garlic in a touch of oil, add remaining ingredients reduce over heat and strain through a sieve. Make sure the josper has been burning for a couple of hours. Remove the ribs from the brine and pat dry. Brush with an even coat of the coffee glaze on each rib. Place the ribs in the josper for a few minutes, make sure there is a good amount of charring on each side until the ribs are dark and caramelized. Place the ribs in a medium baking tray with the beef stock and the onion ketchup, garlic and rosemary. Place in the oven preheated to 100oc . Cook for 8 hours at which point the meat should fall away from the bone. Remove ribs from the braising juices and keep warm. Reduce liquor on a high heat until a nice sticky glaze is formed. To serve brush the ribs with the glaze and place back in the josper for a couple of minutes. Serve immediately with some of the reduced cooking juices.